Wisdom of Life. : Punctunity earns respect and trust. Most Malaysian have a bad habit, we are always not punctual with appointments. Every time we are late, we have reasons like, traffic jam, bus break down or our cars can't start, accident or not feeling well. We have forgotten, the more excuses we give, the more it reflexes on our characters. Being not punctual, relates that one isn't responsible. If the person is fully a committed one, he will be serious to plan right to be on time for each appointment. No matter how far the location or how heavy is the traffic, he will plan to reach his destination perfectly. In my 40 years of selling, I have earned respect to be a serious and responsible person. My punctuality is almost 99.9% perfect. I will always start and plan early to reach my appointments without letting any obstacles to delay my time. I try not to fix the time too near of two meetings in between, cause time can be a constraint to meet up later. As time management is a factor, I have to be careful in planning to meet my clients. 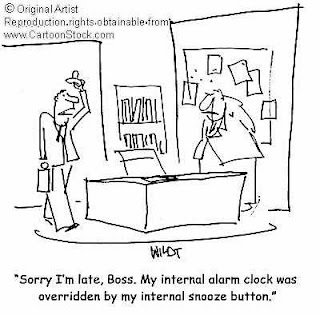 I rather fix lesser appointments than to be late in all my meetings. Most of the time, I prefer to be early to wait for my clients, rather than they be waiting for me instead. By doing so, I then hold a upper hand to my clients. Through the many years of dealing business with my clients who know my punctuality, I have created my creditability and trust with them. Doing business with them is so much easier because they know I will never fail them in any way. My punctuality has reveal my true identity. What about you? Quote of the day; "Respect and trust cannot be given. They have to be earned one step a time."